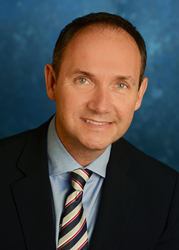 Dr. Cole Edmonson, chief nursing officer at Texas Health Presbyterian Hospital in Dallas, formally assumed the chairmanship at the January meeting of the NLN Foundations Board of Trustees. Cole Edmonson, DNP, RN, FACHE, NEA-BC, FAAN, chief nursing officer at Texas Health Presbyterian Hospital in Dallas, has been named chair of the NLN Foundation for Nursing Education, the National League for Nursing has announced. He formally assumed the post at the January meeting of the foundation’s board. No stranger to the NLN, Dr. Edmonson served on the NLN Commission on Nursing Education Accreditation (NLN CNEA) and is a member of the League’s Accelerating to Practice (A2P) Committee. “It is my pleasure to welcome Cole to this leadership position within the NLN family, so crucial to fulfilling our mission to prepare an outstanding, diverse, culturally competent nursing workforce to advance the health of the nation and the global community,” said NLN president Anne R. Bavier, PhD, RN, FAAN, professor and dean of the College of Nursing and Health Innovation at the University of Texas at Arlington. Over more than two decades in the profession, Dr. Edmonson has been a direct-care nurse, supervisor, manager, director, associate chief nursing officer, and chief nursing officer, before assuming his current position at Texas Health Dallas. His leadership bona fides are reflected in the multiple roles he has played in local, state, and national nursing and health care organizations, as well as in the many prestigious awards he has garnered for his work. A fellow in the American College of Healthcare Executives and the American Academy of Nursing, Dr. Edmonson led two organizations to Magnet and Magnet re-designation in the Dallas/Fort Worth area. Named a 2012 Robert Wood Johnson Foundation executive nurse fellow, Dr. Edmonson was chosen to participate in a three-year leadership development program to enhance nurse leaders’ effectiveness in improving the nation’s health care system. A co-investigator on a study on genomics in nursing practice at Texas Health Dallas, Dr. Edmundson has published and presented on topics as diverse as succession planning, moral courage, culture building, nurse bullying, and balancing the interests of hospitals and academic researchers. The NLN Foundation for Nursing Education, in support of the National League for Nursing, plays a central role in empowering nurse educators in America. Through scholarships, grants, research, and faculty development programs, we are committed to promoting excellence in nursing education to build a strong and diverse nursing workforce to advance the nation’s health while addressing faculty and nursing shortages.